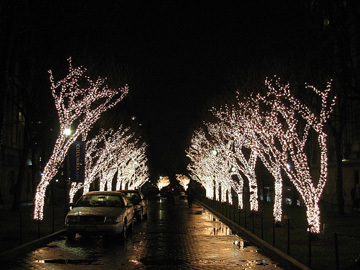 Each year Columbia lights up all the trees along the walk where 116th Street would cut through campus. This is what the trees looked like this evening. I find them horribly pretentious, but this is Columbia. The university has a photo gallery if you want to see more. i like the trees. i remember i was up there a year or 2 ago around this time and had never seen the campus. we took a stroll through.. i thought they were beautiful.